The Gee Jays - Grant Bell, Gary McKenzie and John Didlick - are back with another nostalgic musical journey. Titled Our Way, it will be presented by Rhumbelow Theatre at Tina’s Hotel in Kloof from May 17 to 20, 2018. “Join us as we as they take you on a sentimental journey back to the time when music was music. What we’ve found out is that there’s the right way, the wrong way and there’s the railway. But this time we’re doing it “our way,” say the Gee Jays. 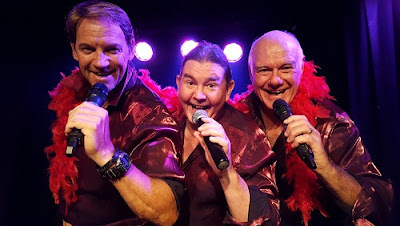 The talented trio, now enjoying their 32nd year together, take audiences on a trip down memory lane and back again with some of those long forgotten songs from such great artists like Andy Williams, Nat King Cole, Bill Haley & The Comets, Frank Sinatra, Dean Martin, Engelbert Humperdink, Louis Armstrong, Frank Ifield and more. The trip back moves through the eras of Elvis Presley, Neil Diamond, The Beatles, Buddy Holly, The Commodores, John Lennon, Simon & Garfunkel and Robbie Williams to name but a few. Some of the numbers featured are: Wonderful World, Rock Around The Clock, Drift Away, Bridge Over Troubled Waters, Sgt. Pepper’s Lonely Hearts Club Band, That’ll Be The Day, Sha Boom and, of course, My Way. All this, interwoven with the notorious Gee Jays own style of comic patter go to make up an evening’s entertainment not to be forgotten. Performances on May 17, 18 and 19 at 20h00 and on May 20 at 14h00 at Tina’s Hotel. The theatre venue opens 60 minutes before show for drinks.